The Australian artist Ron Muecks (b. 1958) has created the sculpture “BOY”. It is the landmark of ARoS Aarhus Kunstmuseum. The five meters tall and 500 kg heavy boy is squatting in all his impressive glory at the northern end of the museum’s special exhibition foyer. BOY is a typical work from Ron Muecks, it is worked out in every detail, so for example skin surface seems alive, and blood vessels and body hair stands out clearly. 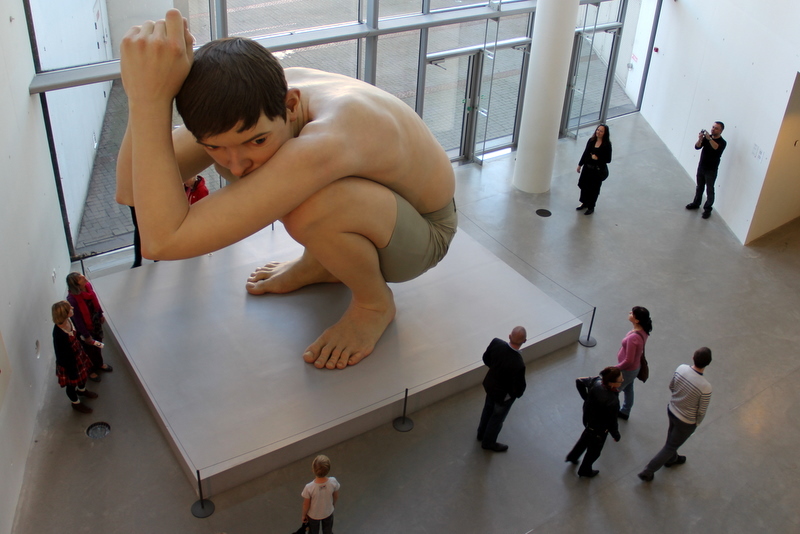 With “BOY” Ron Mueck has created one of the major works in AROS Art Museum’s collection of international contemporary art. I think he is a great artist: He creates things, that noone else in the world does! 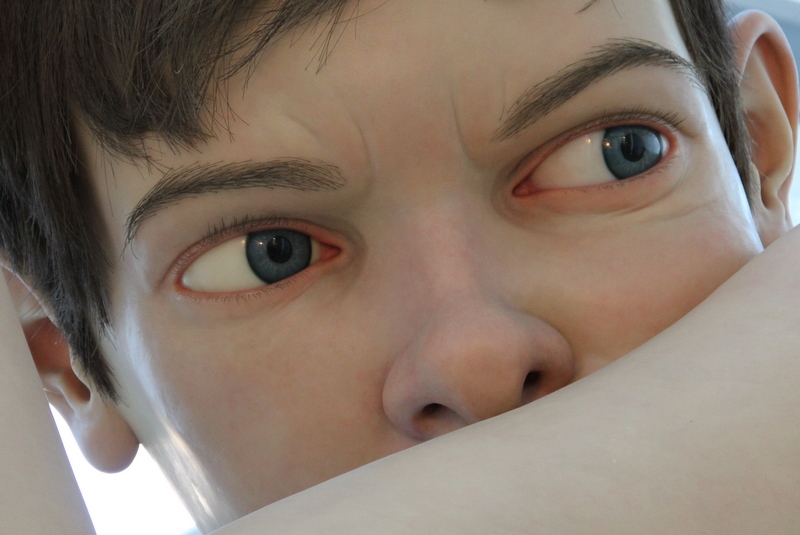 WOW – the sheer size of ‘Boy’ is fantastic and the detail is incredible! Just watched the video…the life-like quaility he manages to create is truly astounding. To see these in person, I imagine you expect them, at any moment, to move! You are right – when i watch BOY (and i love to there just for that!) – he seems SO alive! Wow. I cannot imagine how meticulous work the artist has done. Great post Truels. WOW, – this is awesome, Truels. Both the artist and your photo! Her har vi -12, lavt skydekke med snø i lufta! Uansett, – ut på tur aldri sur! Great that you like this post! I saw a piece of his work at the Tate Gallery in Liverpool, ‘Ghost’ an adolescent girl, I found it quite unsettling, it is the scale I think, that somehow magnifies the emotional effect. You could feel her ‘awkwardness’ and her ‘exposure’ somehow, I wanted to offer her a bath robe!! The video clip was fascinating, the old lady in bed, OMG: very moving, and the juxtaposition of the young school boys and the stabbed youth…. Profound. Thank you for such a gripping post. — and thank you for such a NICE comment. The “Ghost”-girl is great – I’d like to see her too live. Wow… I find the images in the video repelling and moving and puzzling and awe-inspiring and beautiful and frightening all at the same time… There is something rather creepy and disturbing about these extremely realistic figures. I almost expected them to get up and move around! Yes, when i see BOY I feel exactly like you describe here. I’m glad, that i managed to give the impression of how amazing these works are. Tell you what Reggie, I’ve only seen the one sculpture, but I remember thinking I wouldn’t want to be the one on security, alone in the gallery at night! Goodness, yes! I hadn’t even thought of that… Ditto! AROS Museum has SO many guest these days (because of the Rainbow Panorama!) – that they have been forced to keep open two evenings a week until at 22 pm. And I would also prefer meeting BOY instead of GHOST in there at night!!!! I remember his photo on your blog before. So interesting. What amazing work! i took a photo about a month ago of a statue’s shoe, as it looked so real that I was amazed. I love work like that, so thank you so much for sharing. I’d love to see this in person. Great post, Truels! Thanks for adding me there 🙂 xandi. Truels, I’ve a question, is the link true? OK – here’s one more today. Before we translated Led Zeppelin BACK to classical music. Let’s try it the other way! : Listen to this amazing piece of classical music: http://www.youtube.com/watch?v=mmdPQp6Jcdk&feature=related Nice – isn’t it?? This suggestion, The Animals, was mine, yes. I hope you got my “double” suggestion now 🙂 , thanks. What wonderful photos of these fascinating creations. And wishing you much happiness in the new year. I wish all my best for 2012! I’m looking forward to enjoy all your creative images!! Somehow strange or I don’t know weird … The position of sitting , the way of looking at around and the huge size make him somthing with a very huge paradox ! So wonderfull in art and a kind of scary .. 😦 I love your POV from above . Imagine a spaceship is landing in a new and unknown planet and see a huge humanbeing there ! I love to know about night .. what kind of lighting is there in the musium .. ..
You feel a little as in Jonathan Swift’s “Gulliver’s adventure travel” when visiting BOY! Do you know the book (also made into a film!)? Wow. What is the medium? I think these are fabulous but I agree, also a bit disturbing in their reality. The eyes are so lifelike…you have captured some beautiful angles to this amazing sculpture. Thanks. Amazing – yes, that’s what it is! PS Takk for koselig kommentar! Er forsatt hjemme og føler at det går fremover. Mycoplasma er noe …. Tak, Rune 🙂 Jeg håber du fortsat får det bedre. Og snart kan komme til at fotografere flere fine norske motiver. That top picture really illustrates the effectiveness of the size of this sculpture. Ofcourse I know ” Guliver’s adventure ” … but funny I didn’t remember it ! you are right . When I was a child read this book ( translation ) and I watched the animation then . I will wait for that night happily . I was also very fascinated (at the time of the dinosaurs 😉 ) by Gulliver and this very special world of small people around the huge Gulliver. This is a great post, truels and your pictures of this “Boy” very moving. He looks so real, I have never seen anything so realistic. The video in the Queensland Museum (have you been there ?) showing more of Ron Muecks’ sculptures is something one cannot forget. To me, this is Art as close as can be to realness. A kind of naturalistic approach.Very beautiful, thank you so much for this interesting post. We did not go to Brisbane – because of the floodings 😦 – we had to go south from Sydney instead. I would like to have seen this video. AND more of his works! When did you go to Australia? Such intriguing studies of us humans. Thanks for bringing this interesting display to us through your photos and post.